Ok, so I liked Alison Gow's post about the lifecycle of a news story in the 21st Century. 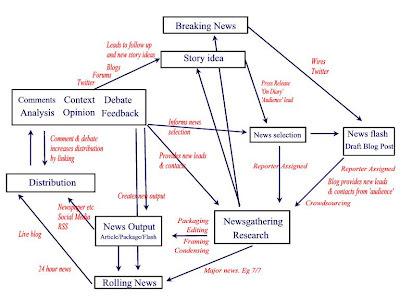 I thought it would be worth combining with some of Paul Bradshaw's ideas in a Model for a 21st Century Newsroom. I thought I might have a punt at visualising the news process as a cycle, rather than as a diamond or in a linear fashion. I thought it might help reveal how the news story is 'unfinished', non-linear, and has the potential to regularly be adjusted by the interactivity offered by the Web. And after all, maybe journalism has become more of a mess than it used to be. Your comments most appreciated.